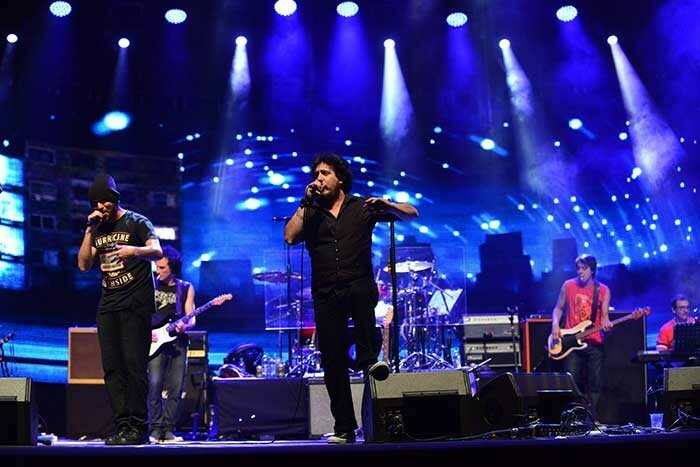 Uruguay - Uruguayan rock and ska band La Vela Puerca played two shows at the Teatro de Verano Ramón Collazo Theatre in Montevideo, Uruguay, with lighting directed by Sebastián Cybulski using Robe ROBIN LEDWash 600 and ColorSpot 1200E moving lights. For this show, called "Uno para todos", Sebastián worked with Gastón Aladefh as assistant LD, adapting an original design from a live performance DVD shoot in Buenos Aires … and this time adding the Robe fixtures. 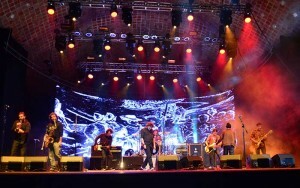 The 16 ColorSpot 1200E ATs and 16 ROBIN LEDWash 600s were rigged on two back trusses and all the lighting equipment for the performances was provided by locally based rental company Alejandro Ottonello Iluminación. Sebastián comments: "All the lights were in excellent condition. Together with the Solís Theatre in Montevideo, Alejandro Ottonello Iluminación has been a pioneer in bringing good quality European made moving head lighting technology to Uruguay." 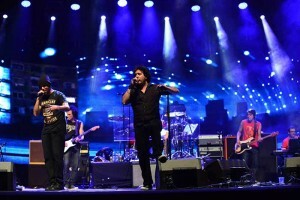 Apart from using the BA DVD shoot as a basis for the lighting scheme, Sebastián had complete freedom to specify the lighting and create a general concept for these shows. He also had to deal with one challenge in the form of a semi-circular video screen in the venue that limited the available rigging space for lights. "Despite this, although because of the screen we had to position the lights closer together, the more ‘concentrated’ effects actually looked really good and I was very satisfied with the overall results," he confirms. Robe products were chosen for their performance and versatility, quick response and easy programming and also for the excellent gobos in the ColorSpot 1200E ATs which "Are really useful for a rock ‘n’ roll concert," remarks Sebastián, who also likes the movement and iris definition. On the LEDWash 600s, he likes the fabulously rich range of colours which go from deep and luscious saturates to the most delicate and subtle of pastels. Guillermo Traverso, Robe’s regional sales manager for Latin America said: "I really liked Sebastián’s rig combining the LEDWash 600s and ColorSpot 1200s. In addition to the effects, the show was full of colour and life. I was also impressed with Alejandro Ottonello Iluminación – as a regular supplier to Teatro de Verano, they completed the installation and set up in record time." Sebastián started his performance industry career as an usher in the theatre … and he has now been working with La Vela Puerca for the last 16 years! "As the band has risen in popularity and the productions have grown bigger and better, I have adapted and stepped up to the task in hand," he says with pride. He is also head of lighting at the Adela Reta Auditory in Montevideo, where he uses Robe fixtures constantly in his work as well as on his numerous freelance projects. The open air Teatro de Verano has been in action for over 65 years and is one of the best known show venues in the Uruguayan capital, both because of its location and its distinctive architecture. Designed by Julio Cesar Giacosa it features an eye-catching high domed metal roof shaped to ensure that all 4218 seats have perfect sightlines to the stage and it and hosts a plethora of national and international productions of all types.